The summer birds are here! They arrive travel-weary yet eager — telling, in their courtship songs, tales of months spent in insect-filled forests far to the south, remembering the lazy droning of sweat bees, the buzz and saw of cicadas, the whine of mosquitoes, the flashing colors of tropical butterflies and the dripping humidity of Malaysia, Thailand, Borneo or southern China. They have arrived into a long, topsy-turvy spring (while blossoms were blooming early in Kyushu, Hokkaido — where I live — looked set to follow suit after it experienced its warmest February day on record; then Tokyo had its latest April snowfall in more than 40 years, and already various Honshu temperatures have reached levels typical of July or August!). Our summer visitors arrived to find lingering cherry blossoms overlapping with flowering magnolias and azaleas. Some summer birds breed quickly in southern Japan, and are moving on already to their second broods, yet some of our over wintering birds have not even left northern Japan bound for their Russian breeding grounds. 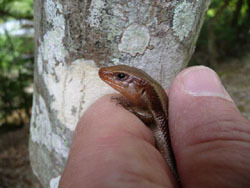 Even now, in mid May, late-arriving migrant birds from the south are only just arriving as the steadily growing warmth begins to tempt forth their cold-blooded, distant cousins — the reptiles. This is an astonishingly diverse season. 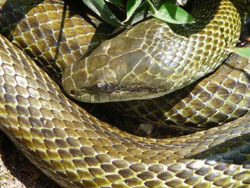 Strong sunshine and warm days bring out snakes, skinks and lizards to bask. 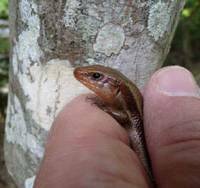 I found the five-lined skink (Eumeces sp. ), pictured here, enjoying warming sunshine recently behind the wonderful Itsukushima Shrine on Miyajima Island in Hiroshima Prefecture. I was more amused to find this Japanese ratsnake, or aodaisho (Elaphe climacophora) (pictured) curling nonchalantly within arm’s reach of dozens of passers-by in Kenrokuen — the classically famous “strolling-garden” in Kanazawa, Ishikawa Prefecture. As each visitor stooped to photograph the lovely waterfall across the pond, or the koi in the pond at their feet, I thought that someone would surely notice this prize creature so close. Even despite my own antics — grovelling to get down low enough to photograph it — no-one asked me, nor investigated, what I was doing. Perhaps foreigners are always grovelling on their knees in Kenrokuen? 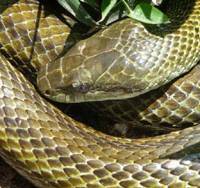 Unperturbed by any of this, however, the snake basked on in the warming sunlight. Meanwhile, in the mountains, the secretive Asian stubtail, a tiny, almost tailless brown warbler fond of low vegetation, fallen logs and narrow wooded gullies, whispers sibilantly of the cicadas on its wintering grounds far to the south, but it must wait weeks before northern cicadas here join in with it’s thin chorus. The jovial Japanese bush warbler, another brown warbler of dense vegetation, explodes into a song redolent of warmth and sunshine, and seems to admonish every lugubrious forest walker to “cheer up” and “think positively.” But when I see newly arrived barn swallows here in Hokkaido (they are only now reaching this far north in any numbers despite nesting being well under way in Kyushu), flitting urgently along river banks and round cow byres, seeking out their insect prey, I cannot help but think of the sea spray on their long sea crossings, of driving headwinds and long dark nights of effort, of close encounters with predatory hawks and falcons — and the sheer exhaustion that must stalk their long journey to reach their breeding grounds here in Japan. Meanwhile, the scratching of claws on bark has an almost reptilian sound to it, and the harsh scolding chatter sounds almost birdlike — but with just a glimpse of ear tufts and tail, it’s clear in an instant that there’s a squirrel about. Before even the first hints of spring appeared, some creatures, such as the squirrels, responded to the lengthening days and began to prepare for the summer ahead. Certainly, by now, for the Japanese squirrels in Honshu and Eurasian red squirrels in Hokkaido, denning time is here once more. If you notice a large ball of twigs, leaves and bark high in the fork of a tree, perhaps it isn’t a bird’s nest. Or if you find scratch marks around the entrance of a tree hole, then you may have found the den (or drey, as they are known) of one of our native squirrels. 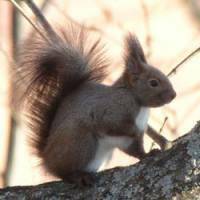 However, if you just happen to be in Kamakura, on Izu-Oshima, in Osaka, or Himeji, then you might encounter instead the introduced, dusky-brown Pallas’s squirrel, which has thrived in certain areas of Japan since its first release around 1935. Most often it is a squirrel’s hard chattering calls and erratic tail flicking that draws attention to it, though on occasions I have witnessed one foot-stamping, showing it’s annoyance at my presence as if it were having a tantrum. 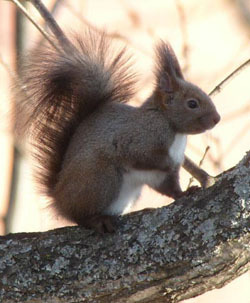 The English name squirrel, by the way, is of ancient origin, and means “shadow tail.” If you are very observant, you might just notice shadow tail’s feeding signs — gnawed bark, stripped pinecones or nuts with scratches and nibble marks. Or perhaps, during winter you might spot footprints in the snow; they’re like miniature hare tracks — two small, two large, in brief series between tree trunks. Once the snow has melted, it is much harder to track them, of course. But scurrying chases round and round tree trunks or back and forth through the treetops during winter and spring are sure sign that a male has picked up the scent of a female and that it is their mating season. On my most recent foray in search of Eurasian red squirrels in central Hokkaido, I encountered this individual (pictured) so busily tearing at tree bark that it was oblivious to my presence. With frenetic speed it tugged and tore, pulled and yanked at strips of bark, then rubbed them and rolled them, sending bark dust and bark flakes raining down until it eventually wound all of the strips up into a ball. Once satisfied with its bundle, it shot away through the trees and was soon lost to sight — but I had no doubt that it was heading in the direction of its drey and was about to line it with fresh, dry bedding. Perhaps in a few weeks time its youngsters will emerge and attempt to rival the flying squirrel for the title of cutest creatures in the woods. In Norse mythology, a squirrel known as Ratatoskr (meaning “drill-tooth”), ran up and down the great world tree Yggdrasil carrying messages between an eagle at the top and a dragon at the bottom. However, I have yet to find any folk tales from Japan concerning these enchanting creatures. If you know of any local tales, or any sites where Japanese squirrels regularly visit garden feeders, do please let me know — I am all ears (though without tufts! ).